Listening exercise for the "Fly Away Home" movie trailer. Key included. I found this short listening on Youtube from Creepy Pasta. It has a scary build-up with a bathroom humour twist at the end. 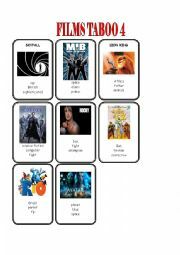 My students have really enjoyed this. There is a link to the listening and a key in the file. Have fun. 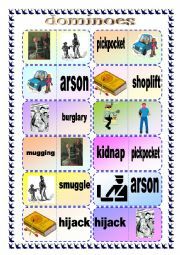 Domino game for learning crime vocabulary. Instructions included. THANK YOU MJ MISA FOR THIS WONDERFUL TEMPLATE! 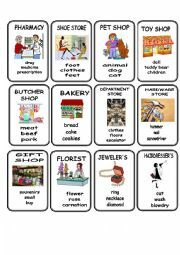 Practice the simple past with a Pink Panther theme. 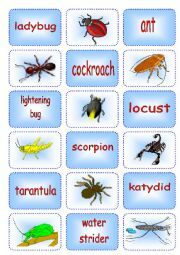 Matching cards for insects and other invertebrates, set 2. Thank you Tanya for the template! 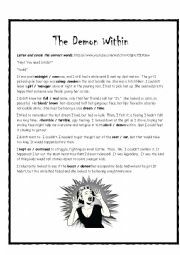 For young learners - read the sentence and circle the correct form of the verb. 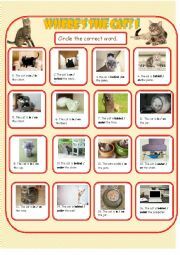 This is a read and match activity about TOYS. 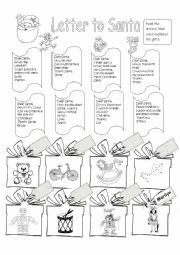 Read the letters to Santa and match them with the toy by coloring and labeling the recipient´s name. Have a Merry! Taboo game for learning different kinds of shops. 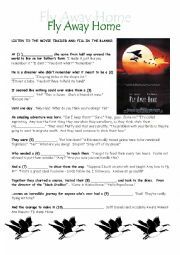 This is a multiple choice game for practicing the Irregular Past Tense Part 1. It’s from A-Z so it’s exhaustive so I had to split it up into 3 parts. I tried to use interesting or amusing pictures. THANK YOU ONCE AGAIN EDITE TENTERE for the template. This is a multiple choice game that goes beyond the normal color range of red, blue, yellow, etc. It practices colors such as evergreen, hot pink, aquamarine, etc. It´s in two parts. The original template has changed a lot but it´s still from Edite Tentere. Thanks! This is part 2 of a multiple choice game that goes beyond the normal color range of red, blue, yellow, etc. It practices colors such as evergreen, hot pink, aquamarine, etc. It´s in two parts. The original template has changed a lot but it´s still from Edite Tentere. Thanks! Game for practicing MINE, YOURS, HIS, HERS. The file was too heavy so I broke in to four parts. Thank you Edit Tentere for this template. 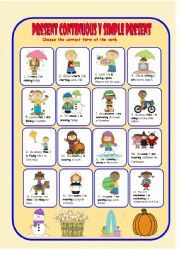 Pretend you are spying on one of the characters and write a report using the present continuous and the present simple. Instructions are on the second slide. Game for practicing MINE, YOURS, HIS, HERS. It was very heavy so I had to Split it in four. Thank you Edit Tentere for this template. This is the third time I´ve tried to upload this. Hope it Works. 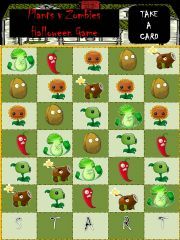 Healthy Unheathy Game Part 2.